pretty pleased with myself, loving the soft warmth of this yarn, and not caring that I messed up the garter stitch! I’m so, so happy to have finished this cowl! 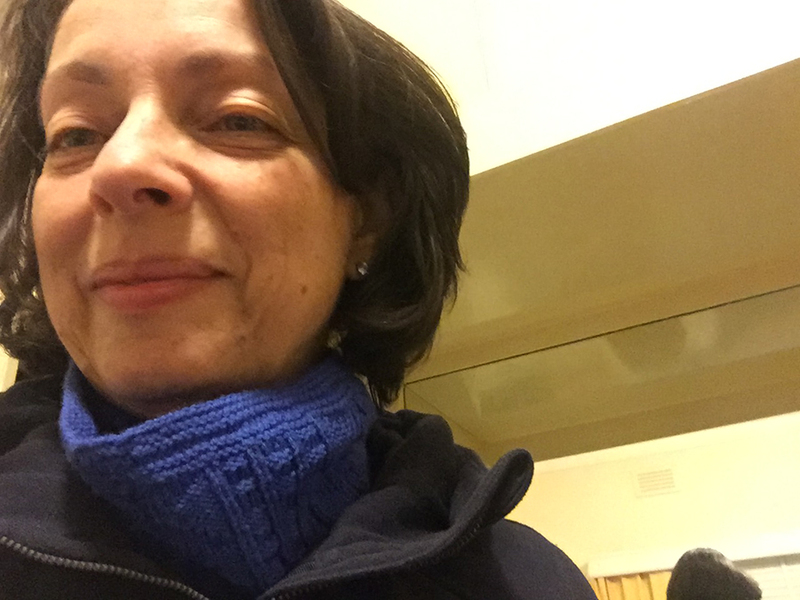 I’d bought the wool from Wool Baa in Port Melbourne back in September 2016, on the way out to Horsham with my daughter. 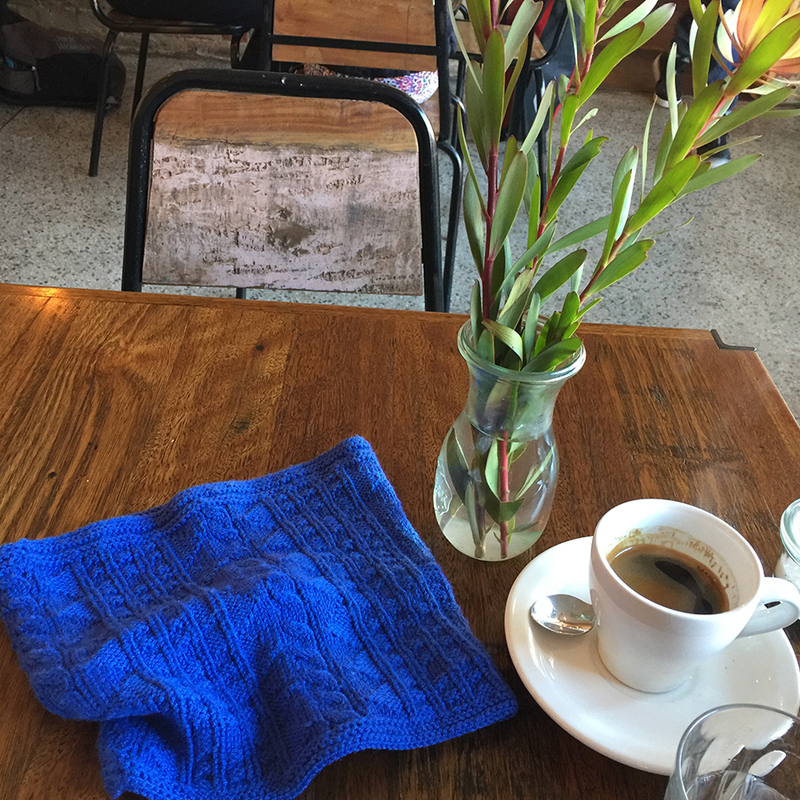 It’s the gorgeous Adorn Silky Merino 4 ply 420 – Sapphire. I had just found the Cat Cay Cowl pattern by Ann Budd on the Quince & Co website, and thought it’d be a great little project to knit on a winter farm holiday. Don’t you just love the colour – a beautiful blue, perfect! My daughter had begged me to take her away somewhere remote so she could quit smoking. Over the years, she’d tried and tried to quit, using all manner of techniques. Patches featured regularly in her attempts, and other things like gum, cutting-down plans, and even a couple of tries at hypnotherapy – all to no avail. So, with a huge commitment to finally end the horrid habit, she bravely admitted that her willpower was rubbish, and said what she basically needed was an “intervention” of sorts. So she scheduled her quit date, and I planned our road trip. Let me just say that it was a rather interesting week, but quit she did! 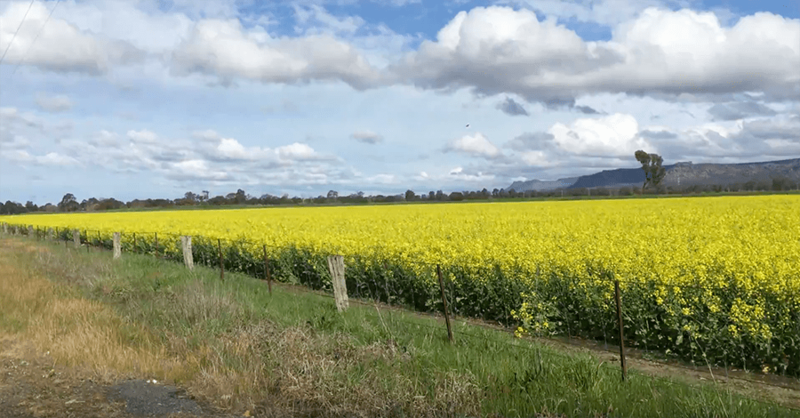 We stayed on an Airbnb farm, with no shops for miles, with some cows, a couple of llamas, a dog, some chickens, and a really lovely walking track. My knitting didn’t really get done much on that trip. I only got as far as the garter stitch border, and then maybe a couple of rows of pattern, but I got so confused that I ended up pulling it out two or three times, and finally gave it up. We walked a lot, Gita ran, enjoying the strange group of animals on the farm that came to greet her as she navigated the long path around the property. She told me yesterday that in about four week’s time, it’ll be a whole twelve months since she quit. She’s so proud. It wasn’t until July this year that I got serious about finishing it. 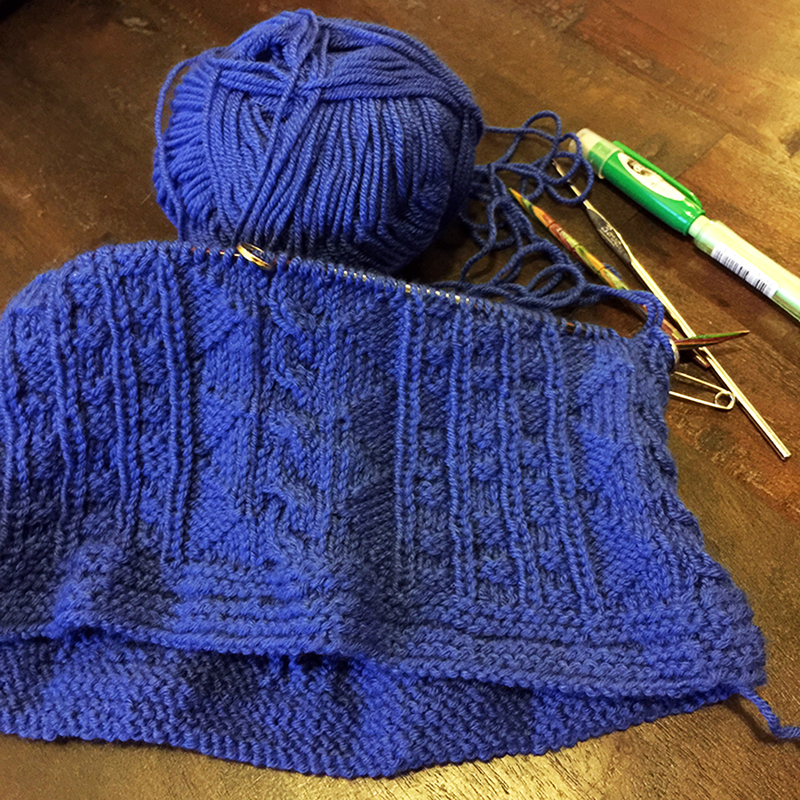 I decided to undo what I’d already knitted, not that I’d done that much, but I hadn’t been able to figure out exactly where I was up to in the chart. 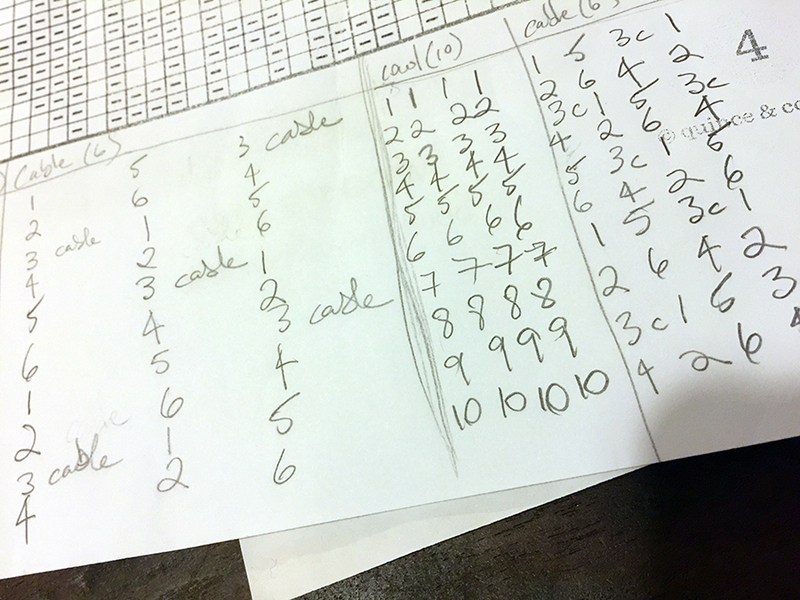 This time round, I’d gotten my head around how to manage the charts as I knit. The four-stitch cable design is on a six row repeat, while the rest of the pattern is on a ten row repeat chart. Took me ages to get my head around how to navigate these two charts, but I finally worked out a simple system. I cannot say it’s completely without errors. They’re not really that noticeable, and I absolutely love my cowl! The yarn is so so soft against the skin, and the colour so vibrant. It’s warm and cozy, and feels divine. 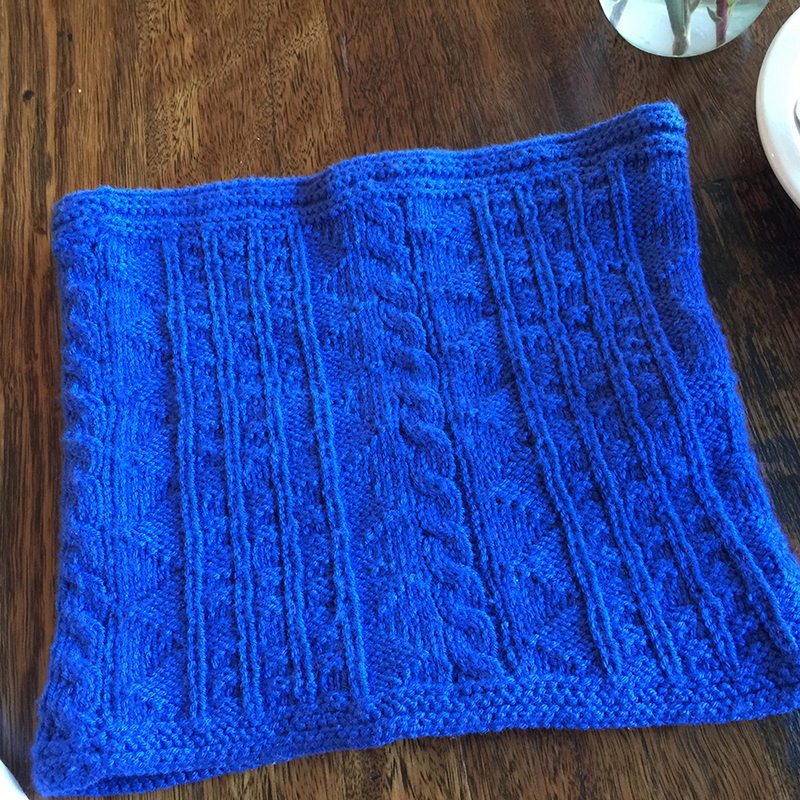 After some very much appreciated advice from the amazing instaknitters community, I washed and blocked the finished cowl, and finally took it out on its first outing this week. Here’s a clear photo so you can see the lovely design of Ann Budd‘s pattern. I can see myself knitting this one again one day, in another colour. Perhaps in a lovely 412 Jacaranda purple, or 413 Pink Kiss. Or even a nice light 421 Smoky Haze grey, or strong 401 Charcoal black. Hmmm. Maybe a few of them in my future. And maybe I’ll just enjoy wearing this one for now. Yarn: 2 x 50g balls of Adorn Silky Merino 4 ply 410 – Sapphire 170 metres; 90% superfine merino wool, 10% silk. Care: Wash by hand using wool soap in warm water, then block. Manufacturer recommends wool cycle machine wash.
For next time: Don’t use dodgy needles that are past their use-by date, making it almost impossible to knit each stitch clean, ie. splitting the yarn, and generally making life unnecessarily hard! Also, pick one way to bring the yarn over the needle on purl, and stick to it! That way the stitches might lie better and the created fabric will look nicer.